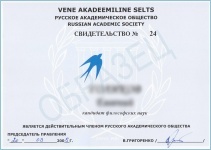 According to the Russian Academic Society Charter any natural person having full higher education (master or doctor of sciences and degrees equal to them) may acquire the status of an ordinary member that acknowledges the objectives of the Society and agrees to fulfill charter requirements, and also to pay membership fees. Acquisition of membership requires a written application for admission addressed to the Executive Board within 7 days from the date of receipt. may delete a member from the list. The list of members of the Society is kept by Chairman of Board. Termination of membership A member may declare his or her withdrawal from the Society in writing from the date of filing the application. General meeting on representation of the Executive Board may exclude a member who has deliberately and seriously harmed the Society´s image and honor. The member of the Society is considered left from the date of removal of the corresponding decision. The decision on exception is sent to the excluded member of the Society by the certified mail to the address specified in the member list of the Society. The decision is considered received through seven (7) days from the date of sending. In accordance with the RAS Charter point 3.2 members of the Society are obliged to fulfill requirements of the Charter and the Board decision, pay admission and membership fees. According to the decision of the Board from February, 7th, 2012 the annual fees are 10 euro . 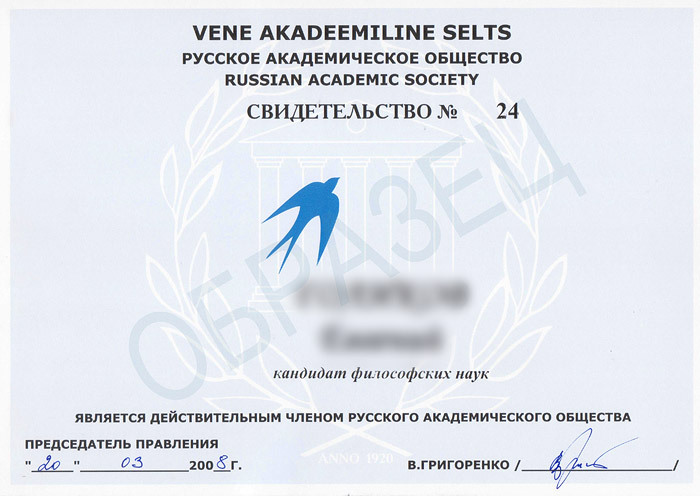 Membership dues are listed on the Russian Open Society account.